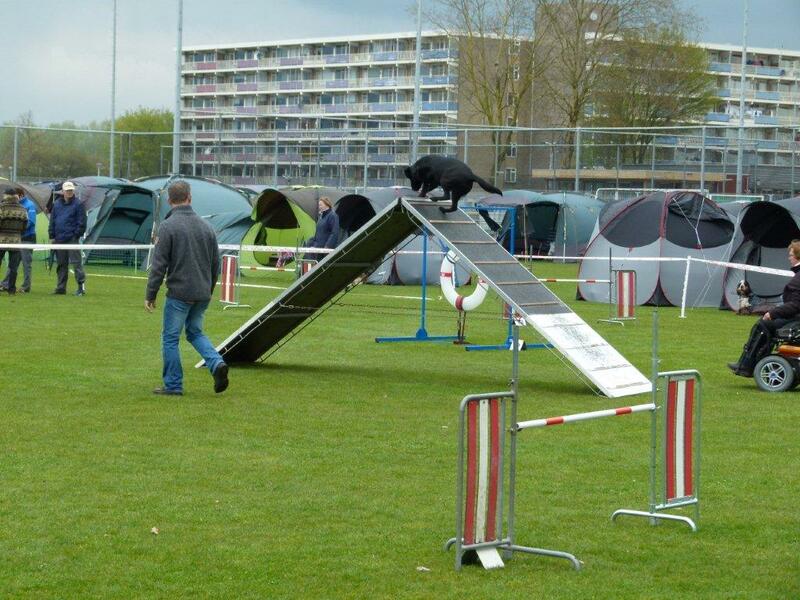 Dogsportschool HSVA in Amersfoort is organising two times each year a agility-competition for his members. Joy had problems with the dogwalk, because early she was falling off. I had make the choice to take time with her and take the dogwalk again, but this had given disqualifications. Joy became 13th, but Joep had run nice clear courses and became first place. In the DIT-Hal in Bergen op Zoom was an agility-match of the Dutch Cynophilia-competition organised by Agilityfriends (www.agilityfriends.nl). Only for the A-classe, so only Joy could take part. On saterday an evening-match with an agility- and jumping course, I had entried my young dog Joy. Joy was running a very good agility- and also jumping-course, just one refusual on both. Joy into the A-classe large and Joep into the Veteran-classe large. For Joy on saterday into the A-classe and Joep on Sunday into the Veteran-classe large. Two days, but I like it very much....just time for each dog and not to run between two different courses. Joy was running her first clear run! Joep was running again and had some nice runs. The other two courses she was running good (just nearly two years old) and the courses were very difficult. I had entry with my dog Joep( his first official match into the Veteran-class) and my young dog Joy (for her the first official match into the Dutch Agility Competition of Cynophilia). Joep was a little injured so I had him check out. Joy was running good, I was satisfied, only a few faults. For the time (more then MCT) she became 2x Disqualifications. First agility-match mutual on dogschool HSVA in Amersfoort where I'm training with Joep and Joy. Joep had run a nice clear agility-course, but on the jumping a fault. Joy was running a disqualification on the agility-course because she was choosing the hole of the tunnel just behind the A-frame...but she had to take the otherone ;-).... the rest of the course was okay, also the jumping. I Had entry with Joep into medium-classe (he will started Veteran-classe this year), and with Joy into the large of this first selection-match for the Dutch IMCA-team. Judge David Hutchinson from the UK ( he will also be a judge on the IMCA & PAWC 2012 in Belgium) had make not easy courses... a lot of the competitors had run a disqualification. Joy was also running a disqualification on the agility-couse, but Joep had a clear run. Unfortunately a time- disqualification for Joep on the agility and jumping-course, witch also without faults. Also the Game-course was very nice! Joy had run one fault on the jumping and on the Game-course 2x refusual, but I was very proud on her, just 21 months old! 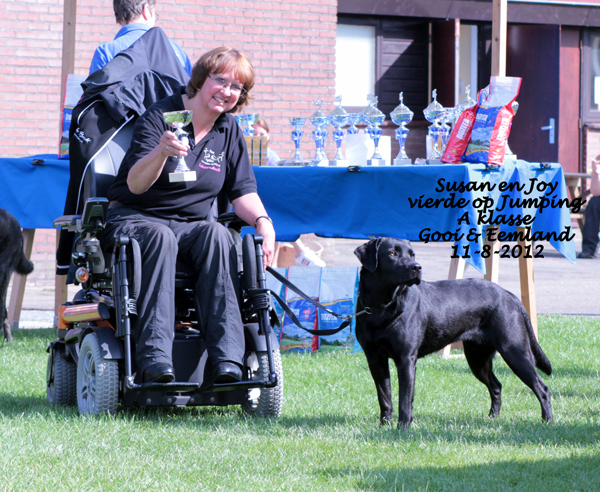 They had invited us to take part (only Joy) together Vera Janssens from Belgium, to show para-agility. Nice courses made by judge Rauno Virta from Finland, for him the first time he saw para-agility. Joy was running good on both courses (one agility and one jumping) only some faults.